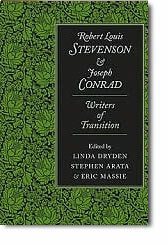 Robert Louis Stevenson and Joseph Conrad: Writers of Transition, edited by Linda Dryden, Stephen Arata, and Eric Massie. Lubbock: Texas Tech University Press, 2009. 288 pp. $55. I stood once on a hill in Samoa, mudded and weary from the long hot climb, wondering at the immense and dedicated toil involved in bringing the body of Robert Louis Stevenson to such a grave. “Ah!” said an elderly Samoan by my side, twitching his lavalava. “He loved the people.” Stevenson came to the area a writer, his pen alert; Conrad’s colonial experiences were mostly behind him when he wrote his first novel. Until recently the two authors have rarely shared the same breath but this overdue association is remedied by this current collection of essays, the fruits of a conference held in Edinburgh in 2004. The dust-wrapper eschews a picture and frames its title effectively in a floral pattern of gentle green. This simple device instantly attracts. In her introduction, Linda Dryden refutes the notion that literary Modernism has “a unique starting point” with Conrad as its inaugurator and cites Stevenson’s role in its evolution. Though the writers never met, they are linked in various ways, and this volume seeks “to probe the Stevenson/Conrad nexus to produce new understandings about two of the most famous writers of the late nineteenth century.” Dryden herself suggests some connections and entices us into the main body of the volume. This is divided into three parts. Under the heading “Stevenson and Conrad: Writers of Transition” are grouped four essays. Richard Ambrosini reviews the history of how the two writers have been perceived, noting that critical theorists place them in different epochs, although they were born only seven years apart. Ambrosini makes some telling comparisons as evidence that this should not be the case and shows, particularly, how Stevenson supported the Samoans in their disputes with German authority. He rightly criticizes the glib allocation of authors into rigid categories and shows how inaccurate this is here. Eric Massie, in an illuminating comparison of The Ebb-Tide and Victory, provides further evidence for this view and stresses the importance of The Ebb-Tide as a Modernist work. He stresses the colonial parallels between Stevenson and Conrad, one being a Scot brought up in a country effectively colonized by the English, the other a Pole brought up in Russian-controlled Ukraine. Both writers could therefore empathize with those living under colonial rule because they themselves had experienced it. Nathalie Jaëck makes much use of nautical metaphors, showing how “apparently harmless literary stowaways ... board the main text ... opening serious leaks in its integrity.” Captain Flint’s logbook in Treasure Island and Kurtz’s journal in “Heart of Darkness” are given as examples. This is an entertaining way of illustrating a key point – that both authors disliked tidy endings, and their narrators and characters can be seen to be grasping at utterance and falling short. Finality eludes them as it does us. This is convincing but not all the language used succeeds as well as the metaphors. Stevenson declared war against the adjective, Jaëck tells us. After clambering over words such as rhizomatic, pleonastic, hodological, apical, and Deleuzian, one began to wish that Jaëck had done the same. Laurence Davies’s exploration of the double in Stevenson and Conrad (types, purposes, and possible extensions), which embraces nineteenth-century texts by other authors besides the obvious candidates – “The Secret Sharer” and The Strange Case of Dr Jekyll and Mr Hyde – usefully ends this section. Part Two considers “Stevenson and Conrad: Writing the Empire” and begins strongly with Andrea White’s study of The Strange Case of Dr Jekyll and Mr Hyde and, unexpectedly, “A Smile of Fortune.” The Conrad story, she explains, is not just “another island tale”; like Jekyll (though less lethally) its captain narrator discovers unwelcome aspects of himself when he succumbs to the seductions of commerce and passion. Immediate connections between the stories (one in the darkness of London; the other in the light of the exotic East) are not obvious and the interweaving White undertakes is both skilful and convincing. Monica Bungaro considers In the South Seas and “Heart of Darkness,” comparing Stevenson’s concerns at observing and adapting to an Island culture in the Pacific with Conrad’s criticism of European behaviour in the Congo. Stevenson cites knowledge of the clans of the Scottish Highlands as helping his understanding of the culture of Polynesia and Conrad’s Marlow is aware of “a claim of distant kinship” in the eyes of his dead helmsman. Ann C. Colley looks at how Stevenson and Conrad cope with cannibalism, pointing out that Stevenson was perturbed by living among ex-cannibals whilst Conrad was simply passing through and making use of them. She also reveals, though, that sometimes the local population would exaggerate cannibalistic aspects of their past to impress and appal their European visitors, whilst conceding the demise of one missionary victim en route. Robbie B. H. Goh compares The Ebb-Tide – clearly a key text in these exchanges – with An Outcast of the Islands, considering the sea as liminal symbol, revealing how both stories show characters in shifting positions or states of mind, always, as it were, in transit – never fully arrived. What is particularly enthralling about Robert Hampson’s essay on Treasure Island and Victory is that it takes a text, usually dismissed as the quintessential boys’ adventure story, and reveals that, given the scrutiny of astute criticism, it proves to be much more. The final section, “Social and Psychological Contexts,” begins with Deaglán Ó’Donghaile’s essay on Stevenson and Conrad’s reactions to late nineteenth-century bomb attacks: The Dynamiter in the case of Stevenson, The Secret Agent for Conrad. Both have would-be bombers (the deliberate Zero and the innocent Stevie) inadvertently blowing themselves up. The essay considers incidents of the time, especially Irish bombings, and shows how both writers were influenced by these in their works. Martin Danahay returns to the figure of the double, making use once more of “The Secret Sharer” but comparing it this time with “Markheim.” He stresses how memories of religious past bring Markheim to confess his crime but might profitably have considered Leggatt’s religious upbringing (his father is a parson) which makes him aware of his fate being akin to that of Cain, fleeing a society that he can never rejoin. What is evident from this and other essays in the collection is that critics take the “land” view of Leggatt’s act, regarding him as a criminal and a murderer, aligning themselves with the “old fellow in a wig and twelve respectable tradesmen” Leggatt claims are not competent to judge him. The story suggests that his actions can only be understood by those who have themselves experienced the vicissitudes of life at sea, like the narrator (or, indeed, Conrad). One of the delights of this book is the variety of texts that are brought into the frame for comparison. Alongside the familiar “Heart of Darkness,” Jane V. Rago places The Suicide Club and relates it to the development of degeneration theories in the latter part of the century. Whilst Kurtz in “Heart of Darkness” exhibits the degeneration of the European “off the map,” The Suicide Club shows the degeneration of the upper classes in London. By joining the club Prince Florizel also “goes native” and is saved only by someone who remains a non- member. Nancy Bunge considers how The Strange Case of Dr Jekyll and Mr Hyde and “Heart of Darkness” anticipate the psychological theories of Sigmund Freud and C. G. Jung. Both psychologists claim that “unconscious forces inspire artists to create” but Bunge contends that writers can understand the dynamics of such forces. Whilst Freud and Jung claimed to be revealing truth and had their findings questioned, Stevenson and Conrad were aware that they were writing fiction and their two great short works endure to this day. The final essay in the collection is by Stephen Donovan, who, under the intriguing title “Pleasant Spectres and Malformed Shades,” notes attempts to link the paranormal to Stevenson and considers Stevenson and Conrad’s treatment of the subject. In many of the essays there is a sense of needing to justify the alignment of Stevenson with Conrad’s exalted presence, rather like a musicologist of the 1950s arguing that the works of Gustav Mahler should be played at Proms Concerts (he was then out of fashion). That this need should be felt is testimony to the power of assertion, which, once trumpeted loud enough, becomes established as fact without the call for evidence. About thirty years ago Professor Sandison gave a lecture on Stevenson to the English Department of the University of Canterbury in Christchurch, New Zealand. It was the first intimation I had that Stevenson was beginning to be taken seriously by the academic world. Robert Louis Stevenson and Joseph Conrad: Writers of Transition produces convincing evidence that this lengthy process should now be complete and that we have been bereft of such an examination for too long.